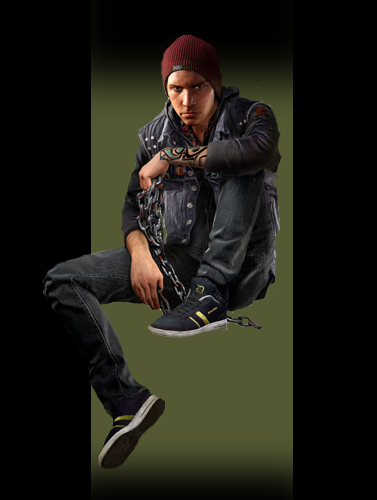 "Below is our announcement trailer for inFAMOUS:Second Son. This trailer holds a very special place in my heart because I co-directed it with the awesomely talented Dave Molloy. We were still in a place on Second Son where we felt we were floundering a bit. Anytime you work on a new platform, like we were with the Playstation 4, you deal with a great deal of uncertainty. There was also a great deal of pressure on us to be one of the standout exclusives coming out in Sony's launch window. Once we came up with a concept that everyone liked, we only had 2 months to produce our 2 minute trailer. It was beyond insane and our team was very doubtful we could pull it off. A crazy mission calls for a crazy plan. So, I worked with our supremely talented team of artists and coders to layout a beat sheet outlining the shots we could produce. Over our Christmas break I brought home our Moven mocap system and acted out the ENTIRE trailer minus the very last shot. The "You are not in Control" shot was captured with the uber talented Troy Baker on the Digital Domain stage. However, everything else. Every shot. Every actor, was me running around my house in a mocap suit. I then took all the data through our "Copy Cat" mocap pipeline(that I'd helped develop for inFAMOUS 2) and set up the scene assemblies. I also animated all the cameras except the two opening shots. When everyone came back from Christmas break...momentum had shifted and everyone could see the skeleton of what we were doing. The best thing about the team I work with at Sucker Punch is that all you have to do is get everyone inspired and believing in the end product and they can move mountains. That's exactly what everyone did from that point forward. Everyone at Sucker Punch and Sony were super happy with the results."